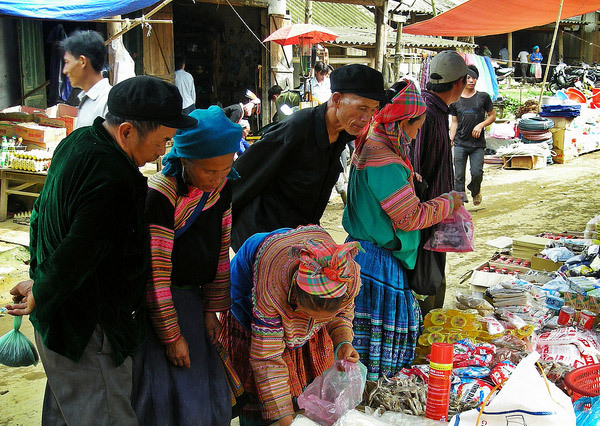 Taking place every Thursday, Lung Khau Nhin Market is a small market hiding itself amongst the mountains and forests of the far north Vietnam about 10 km from the border with China. Although not being so big or famous among visitors as Coc Ly and Can Cau, Lung Khau Nhin market, be side a normal shopping place, play an important role to spiritual life of local ethnic peoples Flower H’mong, Black Zao, Zay, and especially to those who come from very small ethnic groups such as Pa Zi, Tou Zi, Tou Lao who live in small and isolated villages around this corner of the country, come for meeting, socializing…Lung Khau Nhin brings an interesting view into the life of Vietnam hill tribes. As it is for years, weekly market is something important and meaningful to the life of local people who live in remote area. Once getting close to the lovely Flower Hmong, Tay, Dao peoples, you will for sure, feel our land as a place of the special. From Lao Cai: 65Km and takes nearly 2 hours by road; From Sapa: 102km and takes about 3 hours by road.